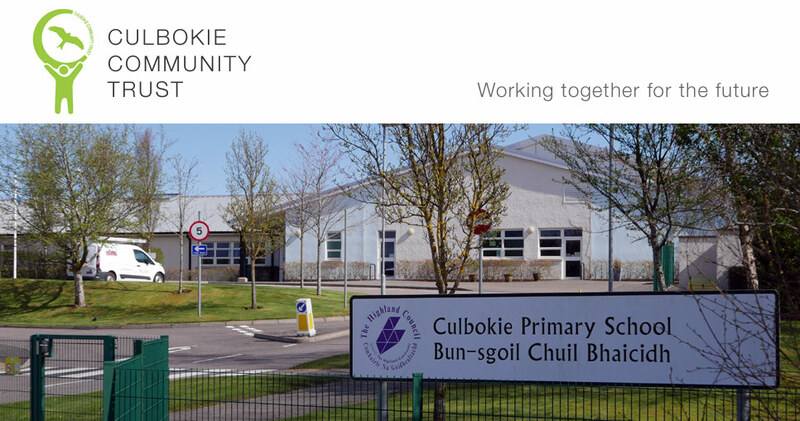 We have been in communication with Ruth and Paris Major, Martha’s Vineyard, MA who have shared with us their researches into their ancestors who lived in Culbokie in the area known as Knockmisan. Their ancestor John Urquhart was born there, and emigrated in the mid to late 1780s. His father William Urquhart’s farm & kiln are shown on the Plan. See map in Gallery at foot of the page. As the descendant of Urquhart, MacKenzie and McCrae ancestors from the Culbokie/Findon area of Ferintosh, we have been fascinated by your articles. Paris and I have spent the better part of the last five years piecing our story back to Ferintosh. I am writing an historical novel about William Urquhart's great grandson, Captain William Urquhart of Essex, CT. The story focuses on Captain Urquhart's first command in 1861-2, and it is based on actual events. William and Catherine (McCrae) Urquhart whose property is seen on the old 1769 Map of the Estate and Barony of Findon and the home, out buildings, garden, kiln and large kiln field are all shown on that map. I am researching what the kiln field was used for and I suspect it was for processing bere (grain). During our trip in April 2017 we went to Dunvornie Farm first which was a surreal experience as I could really feel my 5th great grandmother, Margaret MacKenzie's presence. Dunvornie is where William Urquhart's parents, Thomas Urquhart and Margaret MacKenzie were married on May 5, 1717. 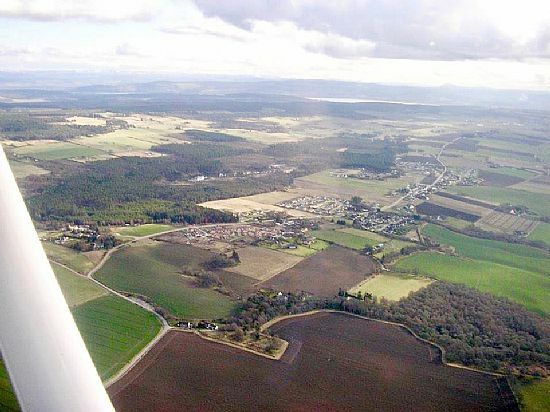 Their son William, as mentioned, moved up the road to Findon (an area known as Cnocmisan) on the edge of Culbokie where his children John and Catherine grew up. When we finally got home to the Vineyard, Paris received a CD she ordered from the National Archives of Scotland with a copy of some sections of the 1769 map of Findon. We were thrilled to see our ancestors and neighbours (mentioned in a birth registry) actually living in the same neighbourhood, according to the map. By comparing with later maps (1870) we found William's house was still standing and maintained, though no mention of the kiln or field. Paris went onto Google Earth and explored the area around William's home. It was there that she noticed that Burnside Cottage was right across the street from William's Homestead, of which there is now no trace, except on old tattered maps and in our ancient memories. The study of names for one location in Findon/Culbokie from before 1764 to about 1906 when the name has vanished from OS maps. William and Catherine Urquhart lived in homestead as tenants in this place and worked a garden, Kiln and Kiln field in this place, as seen on the Findon Estate Map of 1769. Their children were born and raised there. 3.) 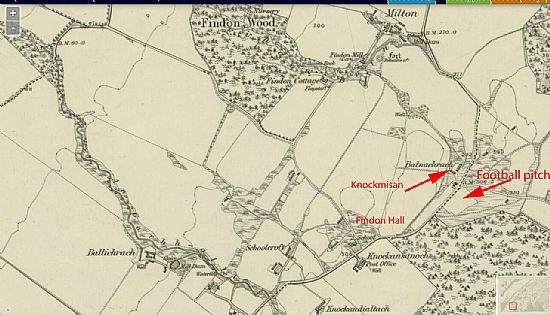 KNOCKMISAN- spelling of the Place William Urquhart’s children were born and his homestead, kiln and kiln field were documented in an aerial view as seen on the 1769 Map of the Estate and Barony of Findon. *On this 1769 Estate map, just above the place name, KNOCKMISAN, a bit to the right, you find the place name BALAWOCHAR or BALWOCHAR, Note: BAL(A)WOCHAR may be another attempt to render Bail’ Uachdarach by someone who cannot write Gaelic. 6) BALUACHNACH - The name given for the place where William Urquhart’s thatched one story Homestead still stood, as did thatched outbuildings, but the Kiln/Kilnfield is not mentioned. The proprietor of the property was Capt. James D. Mackenzie, Mountgerald by Dingwall. Ordinance Survey of 1870. 7.) BALNACKRACH - The name given to the area surrounding the former homestead of William Urquhart. Proprietor, James D. Mackenzie, Map: Ross-shire & Cromartyshire, Sheet LXXVII, 1871-5, Publication date: 1880. *Our thanks to Ken MacKinnon, for his valuable help with these place names. Ken MacKinnon gave a presentation to the History Group which can be found here supported by photogrpahs in its associated Gallery. If any of you can help with the names of this neighbourhood where our ancestors lived, both with regard to the meaning the place name or its evolution, please forward to us. THANK YOU! This is so exciting!! I love how in depth your articles go, and the visuals really help to add ‘life’ to the history of the place. I was lost in your articles for three days!. The site of Knockmisan can be seen on the left-hand side halfway down. It is the triangular patch of uncultivated ground.